This cocktail recipes takes a bit of time and effort to prepare, but it’s all worth it in the end. 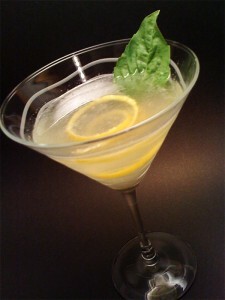 The vanilla basil syrup pairs up brilliantly with the fresh lemon juice in the final result. Cheers! Add the ingredients to a cocktail shaker filled with ice. Shake well, then strain into a cocktail glass. Add a fresh basil leaf and long twist of lemon to garnish. Combine the water and sugar in a sauce pan over medium heat. Stir lightly until the sugar totally dissolves. Turn the heat to low and add the basil leaves and vanilla. Let the syrup steep for 5 minutes over the low hear, then turn it off and let steep for an additional 20 minutes. Adapted from a post at Cook by Your Wits.